Our high quality wide yoga headband is made from soft stretchy fabric and hugs your head and will stay put without being too tight. It is a unique and trendy solution for fitness enthusiasts! No need to worry about the sweat when you do the workout, it will absolutely make your day! hiking, climbing, cycling, running, yoga, pilates, fitness, soccer, basketball, baseball, football, tennis and so on. Size before stretching: 9.44" x 3.14"(the largest width) / 24*8 cm. Size after stretching: 15" x 3.14" / 38*8 cm. That is 18-23.6 inch circumference in total, please make sure that your head circumference is between this area. Top Quality Material: Our headbands are made of premium quality polyester, which are soft and stretchy, and ensure that they can last for a long time. And you won't feel uncomfortable when you wear it. 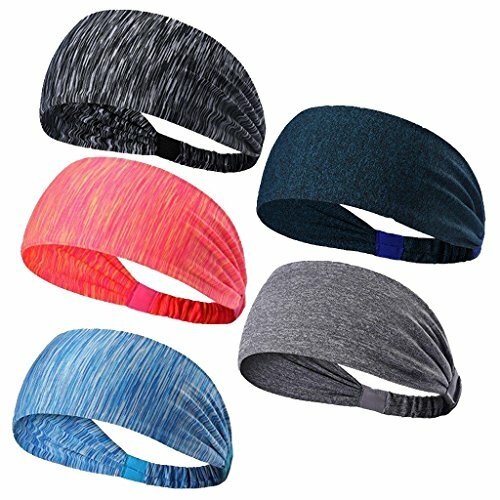 Moisture Wicking: With this headband, you can totally be focused in your sports as it can prevent the sweat from coming down your face to keep your forehead dry, and no bangs to fuss with. Or you can just use it as a decoration to your hair style. One Size Fits Most: Its elastic property makes it possible to fit most of the heads of both men and women. Size before stretching: 9.44" x 3.14"(the largest width) / 24*8 cm. Size after stretching: 15" x 3.14" / 38*8 cm. Please make sure that it fits you before making the purchase. Use widely: Perfect in everyday wearing and all kinds of sports activities like hiking, climbing, cycling, running, yoga, pilates, fitness, soccer, basketball, baseball, football, tennis and so on! Different Colors for You: 5 different, vibrant colors (3 stripe ones and 2 ordinary ones as the picture shows), pick the one that matches best with your outfit and enhance your style instantly. Those fantastic headbands in many beautiful colors will absolutely make your day! If you have any questions about this product by Shinning Go, contact us by completing and submitting the form below. If you are looking for a specif part number, please include it with your message.